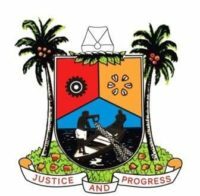 Wife of Lagos State Governor/Chairman, Committee of Wives of Lagos State Officials (COWLSO), Mrs. Bolanle Ambode; Medical Director, Gbagada General Hospital, Dr. Tayo Lawal; representative of Chairman, Health Service Commission, Dr. Tokunbo Oluwole; representative of Commissioner for Health, Dr. (Mrs) Olufunmi Taiwo and Commissioner IV, Health Service Commission, Mrs. Kemi Ogunyemi during the donation of Two Transport Incubator ambulance and Portable Otoread equipment to Four General Hospitals in the state by COWLSO as part of its annual Health Intervention Project for 2018, at the Gbagada General Hospital, on Wednesday, 10 October, 2018. 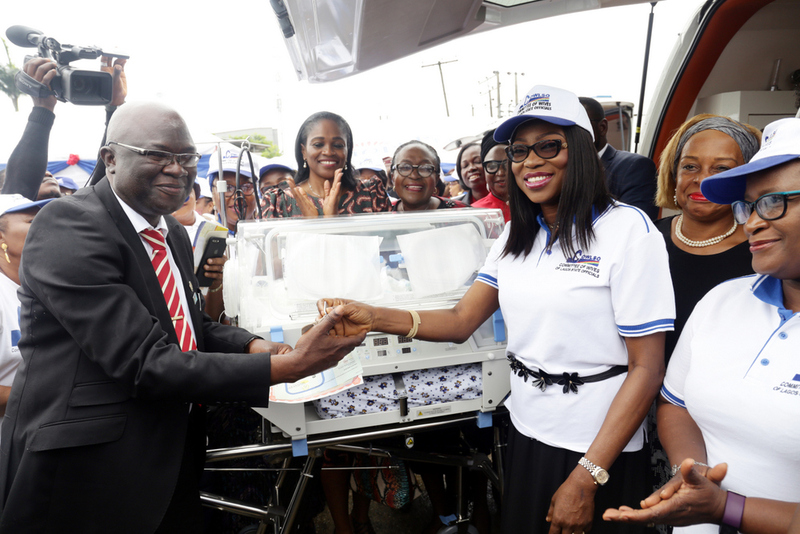 Wife of Lagos State Governor/Chairman, Committee of Wives of Lagos State Officials (COWLSO), Mrs. Bolanle Ambode (2nd right); Medical Director, Gbagada General Hospital, Dr. Tayo Lawal (right); representative of Commissioner for Health, Dr. (Mrs.) Olufunmi Taiwo (2nd left); Commissioner IV, Health Service Commission, Mrs. Kemi Ogunyemi (left) and representative of Chairman, Health Service Commission, Dr. Tokunbo Oluwole (middle), inspecting an incubator during the donation of Two Transport Incubator ambulance and Portable Otoread equipment to Four General Hospitals in the State by COWLSO as part of its annual Health Intervention Project for 2018, at the Gbagada General Hospital, on Wednesday, 10October, 2018. 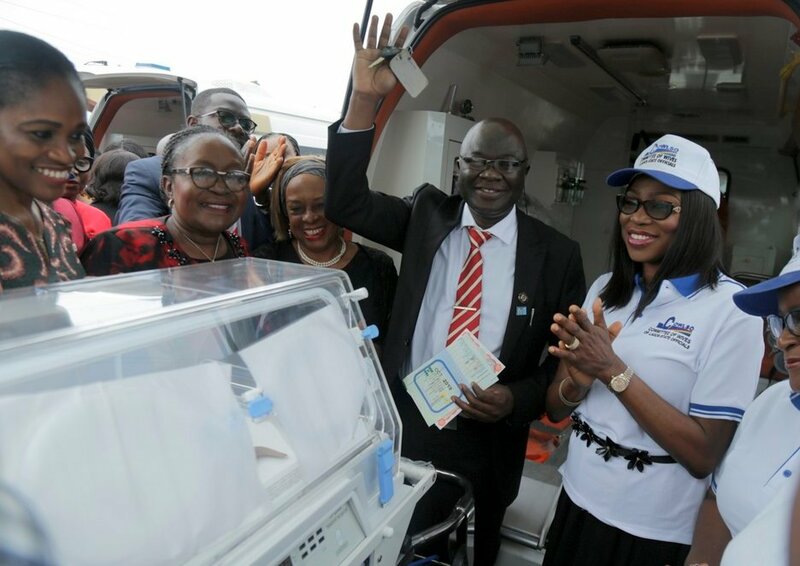 Wife of Lagos State Governor/Chairman, Committee of Wives of Lagos State Officials (COWLSO), Mrs. Bolanle Ambode (3rd right), presenting keys and particulars of Transport Incubator ambulance to the Medical Director, Gbagada General Hospital, Dr. Tayo Lawal (left), while representative of Chairman, Health Service Commission, Dr. Tokunbo Oluwole (2nd right), Permanent Secretary, Accounts (Office of Establishment and Training), Mrs. Olubusola Rhoda Ayinde (left) and members of COWLSO project team, watch during the donation of Two Transport Incubator ambulance and Portable Otoread equipment to Four General Hospitals in the state by COWLSO as part of its annual Health Intervention Project for 2018, at the Gbagada General Hospital, on Wednesday, 10October, 2018. 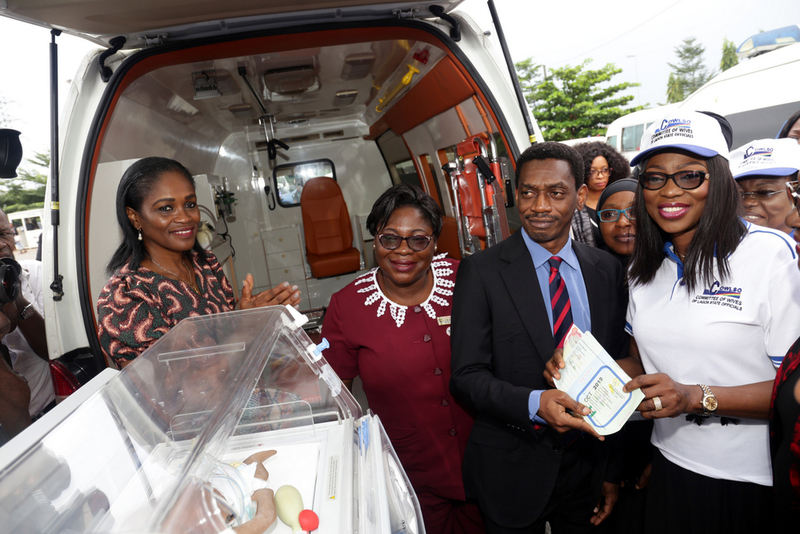 Wife of Lagos State Governor/Chairman, Committee of Wives of Lagos State Officials (COWLSO), Mrs. Bolanle Ambode (right); presenting keys & particulars of Transport Incubator ambulance to representative of Medical Director, Lagos Island Maternity, Dr. Olufemi Omololu and Apex Cole Adebukola during the donation of Two Transport Incubator ambulance and Portable Otoread equipment to Four General Hospitals in the state by COWLSO as part of its annual Health Intervention Project for 2018, at the Gbagada General Hospital, on Wednesday, 10October, 2018. With them is the Commissioner IV, Health Service Commission, Mrs. Kemi Ogunyemi (left). 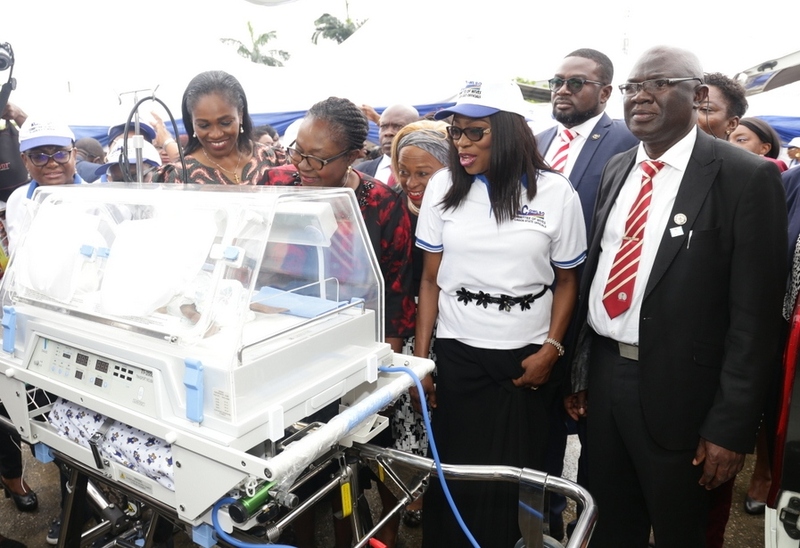 Wife of Lagos State Governor/Chairman, Committee of Wives of Lagos State Officials (COWLSO), Mrs. Bolanle Ambode; Medical Director, Gbagada General Hospital, Dr. Tayo Lawal; representative of Chairman, Health Service Commission, Dr. Tokunbo Oluwole; representative of Commissioner for Health, Dr. (Mrs) Olufunmi Taiwo and Commissioner IV, Health Service Commission, Mrs. Kemi Ogunyemi during the donation of Two Transport Incubator ambulance and Portable Otoread equipment to Four General Hospitals in the state by COWLSO as part of its annual Health Intervention Project for 2018, at the Gbagada General Hospital, on Wednesday, 10October, 2018.